BBQ chickpeas is a new take on traditional roasted chickpeas. 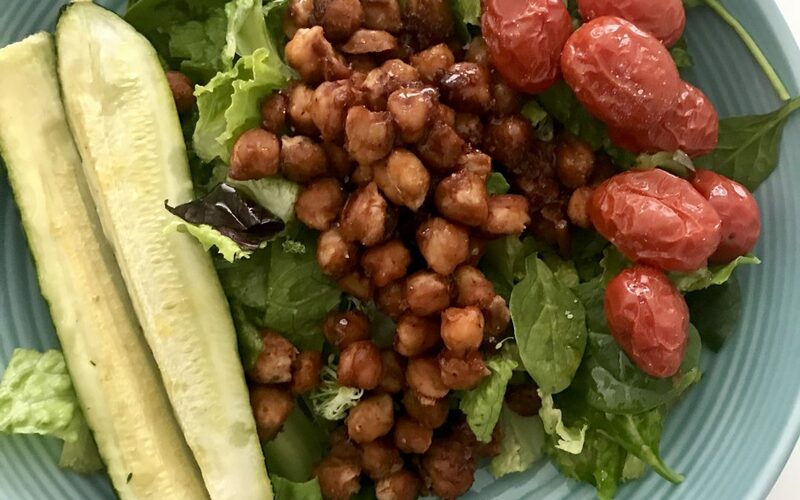 If you are not eating meat, BBQ chickpeas are a good way to get those flavors that you might love (like BBQ) without all the hormones or animal energy. I copied this salad concept from a delicious cafe that I like, but is just too far away to frequent. Benefits of Chickpeas: Chickpeas are loaded with fiber, help stabilize blood sugar, are a plant based protein, are packed with IRON (especially good for healthy heart rhythm function), and have a unique supply of antioxidants. Antioxidants are needed to help your body get rid of chemicals and toxins. Fresh beans, (that you soak first), are usually more delicious then canned, so if you have time and a bag of dried chickpeas, you can soak and cook the whole bag. Doing so is a good way to do some general food prep which I always recommend. 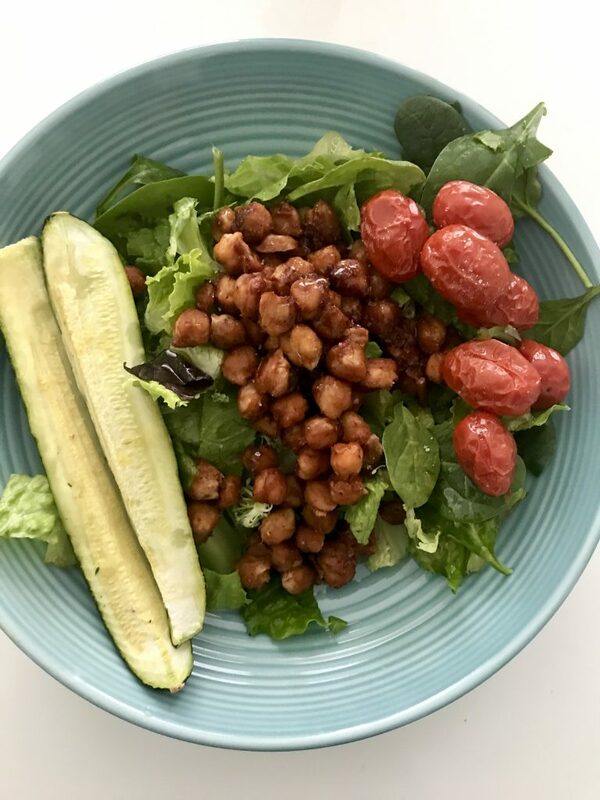 By food prepping a whole batch, you can use chickpeas as your star ingredient all week in several different recipes including this one. (hummus is always another easy recipe to whip up once you have freshly cooked chickpeas on hand! * Side note: Soaking chickpeas helps to lower lectins which many people are interested in reducing. Line a baking tray with parchment paper for easy cleanup. Im obsessed with the parchment “sheets” which are perfectly pre-cut to fit standard baking trays.There is no scrubbing trays involved when you use parchment. Spread the chickpeas over the pan, and drizzle with gluten free BBQ sauce of choice. Then add pink salt, dulse flakes (for nice minerals) and garlic powder. I do not put the chick peas in a bowl first to season and coat them there. I like to dirty as few bowls as possible so I just short cut it and coat the chickpeas directly on the baking tray. It does take an extra minute to make sure all the beans are thoroughly coated, but it means one less bowl to wash and that is of more importance to me. Then I sliced up 2 organic zucchinis and added a few grape tomatoes and add them all to the same baking tray. (Use whatever veggies you have on hand) Again make your life as easy as possible by roasting everything on one tray. Drizzle those veggies with organic extra virgin olive oil and cracked pink salt. Bake for aprox 30 minutes on 350 degrees. Careful not to over-roast the chickpeas. They taste best, in my opinion, when they are slightly crunchy outside and still tender inside. If you do cook them for too long, they don’t get ruined, just crunchy. You can intentionally roast them longer and then eat them in place of chips. Serve your delicious BBQ chickpeas over assorted baby greens and/or spinach and alongside your vegetables..